Apple today announced a major update to its professional video editing app, Final Cut Pro X, with new features including 360-degree VR video editing, advanced color grading tools and support for High Dynamic Range (HDR) video. Optimized to take full advantage of the incredible performance capabilities of the all-new iMac Pro, Final Cut Pro users can now edit full-resolution 8K video for the first time on a Mac. Apple is also extending 360-degree VR video support to Final Cut Pro companion apps, Motion and Compressor. 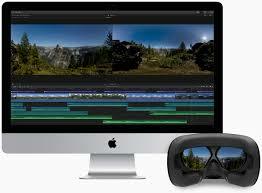 Today, with more than 2 million seats, Final Cut Pro X is the most popular version of the software ever and is used by professional video editors to create incredible works of art, from award-winning Hollywood feature films and commercials, to international broadcasts and the world’s most popular YouTube videos.